That day, Rokuko was relaxing under the kotatsu. At that moment, something unfamiliar appeared on the catalog. An ice cream package with a strange-headed child eating a melon roll appeared. Well, the package was alright. She opened it from the bottom, pulling out the wooden stick covered in ice cream. It was yellow—an ice cream the color of a melon roll. For ice cream, the main part came once it was put in your mouth. She instantly stuffed it into her small mouth. The first thing she tasted was melon-ish. 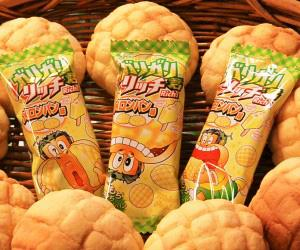 This thing, it had the same sort of impression as melon bread? The taste came immediately? 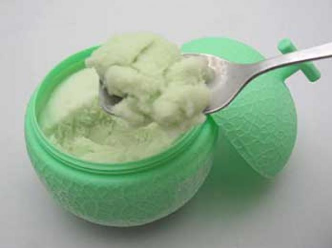 It gave the impression of an elegant melon ice cream. But when she tried to pay close attention to the taste, it didn’t taste like normal melon. Unlike melon flavor, it wasn’t fruity. It had a flavor like a milky bread. That milky flavor from earlier might have been from that. When she bit further into it, she felt some sort of crunchy feeling in her mouth. It was a melon roll disguised as a cookie! Well, that’s a bad way to put it, but the depth of feeling it gave her mouth was just like a melon roll. However, it being like a melon roll was what made her happy. After tasting the aftertaste, Rokuko was convinced that what its flavor was wasn’t melon ice cream, but melon roll ice cream. It had the crisp bite of shaved ice cream. However, the aftertaste from eating a mouthful was definitely a melon roll. Satisfied after finishing it all, she looked at the back of the packaging. It appeared it was something where she could send in the stick for by taping it to a postcard and mailing it in if the branding on stick matched the one on the Gari Plushie. She took a look at the end of the stick that she’d finished eating from. There wasn’t anything stamped on it. Rokuko bought another GariGari-Kun Rich – Melon Roll Flavor. However, she was in another world, so she wouldn’t have been able to turn it in for anything even if it was a winner. By the time she’d realized that, she had a stomach ache and locked herself up in the restroom. *Please be careful of overeating. and now a drink game! Can’t she just buy the plushie through the catalog? But that would defeat the point of it! How did this happen? wasn’t Rokuko’s DP catalogue based on what she knew of or believed as fact? Did she believe in Melon Roll so much that it became an ice cream!? Seems when Dungeon cores go overboard on having their body behave like a humans they have to also deal with the backlash that comes with being human. Thank you kindly for the omake chapter! Hum, never have I ever gotten a stomach ache from eating too much… Nauseous for a while until it gets properly digested, yeah, but a stomach ache? no… Well, actually, once when I ate WAY too much normal food, it started to ache a little bit due to filling my stomach over capacity, but that’s not what they’re talking about here. Seems japanese people have pretty weak physiques, really. All that stuff about getting sick from getting drenched in rain water, from not covering your stomach, seemingly almost dying(being bedridden while sweating floods and not being able to do anything) from fever at levels where I, and others I know of, would just feel a bit giddy and getting an upset stomach from eating a bit too much, especially stuff like ice cream. Oh well, other than that I guess that rokuko is pretty cute, the melon roll “reviews” wasn’t that funny though, I guess it was a bit fluffy with a light feeling? If you’re looking at manga/anime/light novels as an accurate representation of the Japanese/living in Japan then you should also look to the Indiana Jones movies as an accurate representation of what it’s like to be an archeologist.